KOTA KINABALU: The MCA will continue to assist in developing Chinese schools as they play a vital role for the community to learn their mother tongue and inculcate Chinese values, said party president Datuk Seri Ong Ka Ting. He said it was important to know the Chinese language, as it would be an advantage for Malaysians doing business with China. He said the MCA, as a member of the Barisan Nasional, would continue to help the Chinese safeguard their interests. Ong said it would be an advantage for Malaysians to master more languages. 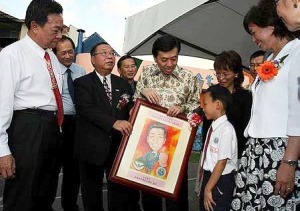 How sweet: Ong receiving a painting of himself done by 10-year-old pupil Jaydeen Yoon at the launch of the Datuk Seri Panglima Wong Kwok Building in Kota Kinabalu. Among those present at the ceremony was the building benefactor’s daughter Sophia (right). He said Malay was not only the national language but a language used widely in Indonesia while English is the language of science and technology. Ong was here to open the Datuk Seri Panglima Wong Kwok Building at SJK (C) Chung Hwa Likas here. It will have 20 classrooms, a dance room and a seating gallery. He said the MCA would help the school raise RM100,000 for the building that was donated by local builder Datuk Wong Kwok. Representing Wong Kwok at the ceremony was his daughter Sophia Wong Siew Ming.